This year I planted my pumkins and squashes on the compost heap. They grew better than ever before and I now have a good collection of various shapes, sizes and varieties in store for winter. I find different varieties work better in different recipes, which is lucky as it keeps me thinking of new ways to cook them. The crown prince is great for soup because it can sometimes be a little floury. 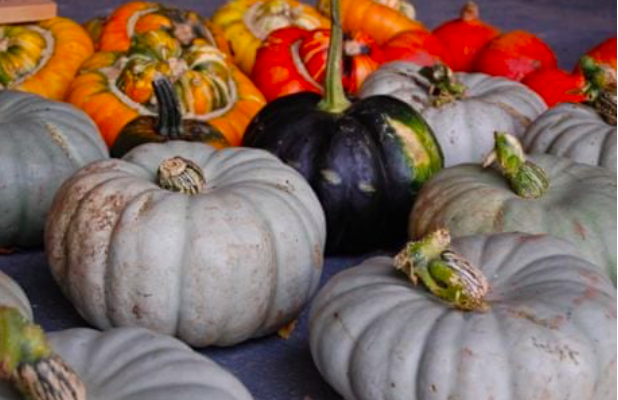 The onion and acorn squash are good for roasting and eating just as they are with melted butter or serving with lentils, in a salad with goat’s cheese or as a side to some roast chicken. 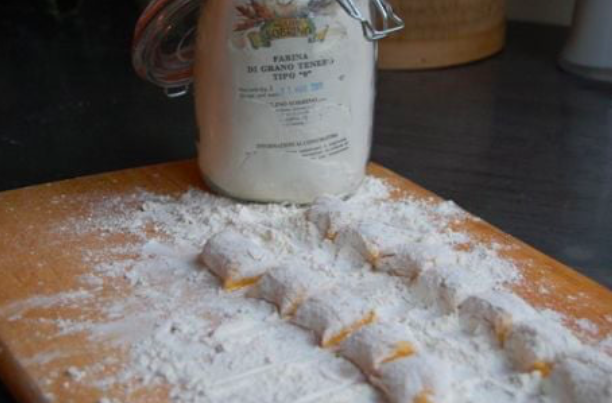 I usually love to make ravioli, but since some of the Crown Prince were quite floury this year, I thought I’d make fat little gnocchi to eat with a delicate oregano infused butter. To add to the squash, I used the last of a good crop of blue Danube potatoes which we’d harvested a few weeks before. They have been disappointingly floury and keep exploding out of their beautiful purple skins when I boil them. But when peeled and cooked, they create a light and smooth mash. Roasting the squash beforehand intensifies the flavour, which when mixed with potato becomes delicate with a lovely background sweetness. You can of course serve it with sage butter but I enjoy the change of using the oregano, which goes so well with squash anyway. Note on the recipe: use these quantities just as a guideline as both potato and squash can vary in water content. Cut your squash into slim wedges and toss with olive oil, salt and pepper and a sprinkle of dried chilli and dried oregano. Roast in the oven for 10 minutes or so or until soft and cooked through. Meanwhile, boil the potatoes in plenty of salted water until they are completely soft. Drain and mash. If you have potato ricer, this is definitely the time to use it as the smoother the mash, the better. Then mash your roasted squash and gently stir together. Season well with salt and pepper and a few grates of nutmeg. Beat the eggs and add them to the mixture one by one. You don’t want the mixture to become too sloppy and you can always add more egg later so be careful at this stage. Add most of the flour and beat briskly, just to mix everything as you don’t want to overwork the flour and potatoes. You are looking for a fairly stiff dough but one that is smooth and soft. Adjust with more flour or egg as necessary and finally check the seasoning. Dust a work surface well and taking a small handful of the mixture, roll it around in the flour on the surface and gently roll it with your palms into a long sausage shape. Repeat this with the rest of the mixture before cutting it into short lengths. Cook the gnocchi in plenty of salted water which is at a good simmer but not a rolling boil. After sinking for a bit, the gnocchi will float to the surface where you should allow them another couple of minutes cooking before scooping them out to drain. Meanwhile, melt the butter in a saucepan with the oregano until it just begins to brown then pour over the gnocchi and grate over a little parmesan.